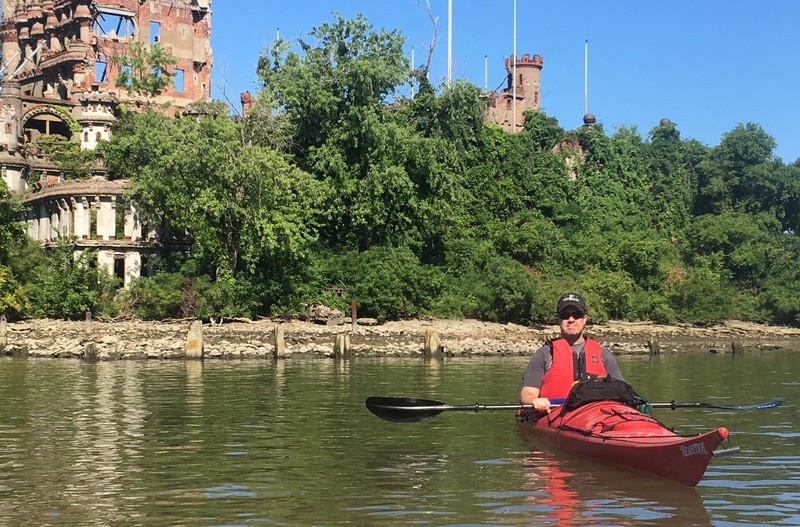 I’ve wanted to paddle around Bannerman Island ever since I learned about it’s quirky history during a protracted Wikipedia spiral. When I resolved to expand my paddling universe, it was on my list. It was only when I got to the nitty gritty of planning that I connected it with the notorious “kayak murder” case. Turns out when Angelika Graswald allegedly sent her lover to the great beyond, they had left from the same spot I’d selected. 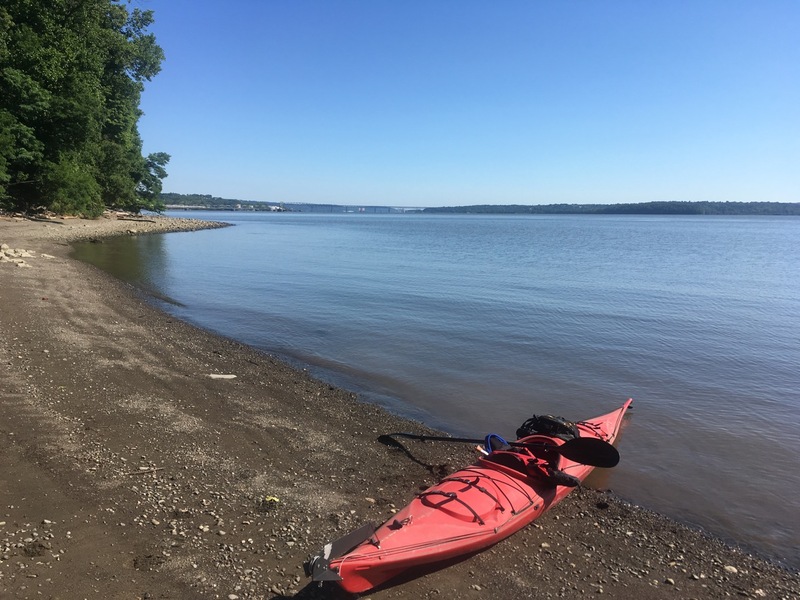 I got to Plum Point in Cornwall-on-Hudson and launched around 9:30 AM. 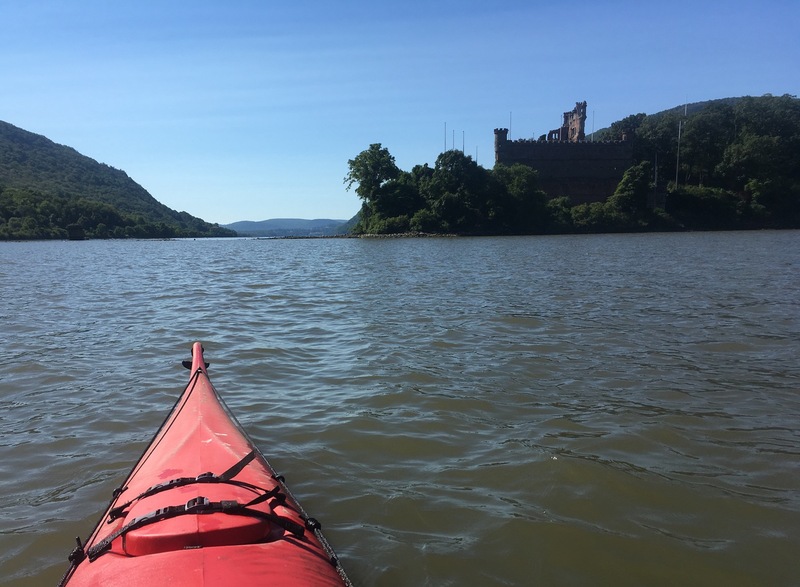 Bannerman Castle is located on Pollepel Island, on the opposite side of the Hudson from Cornwall so my paddle started with a crossing. The river is narrower here — then near the Tappan Zee where I normally paddle — but it’s still wide enough that crossing it gave me pause. It went without incident; there was very little traffic that early. I turned south to paddle towards Pollepel, enjoying myself immensely. Part of the joy of kayaking comes from rhythm of motion. It’s a sort of an ascetic pursuit, like Nordic skiing, hopefully a little zen. I was feeling it that morning and I lost myself in the paddling. Approaching the island, I tried to recall it’s odd history. It’s not actually a castle of course. It just looks like one. Francis Bannerman IV started construction of it in 1901, to store munitions which the U.S. Military had captured in the Spanish American War and subsequently sold to him as surplus. To make a long story short, there was an explosion in 1920, the state bought the place in ’67, it was declared off limits after a fire in ’69 that took out the buildings’ roofs. It stood as a place for adventurous teenagers to party; more walls fell in 2009. 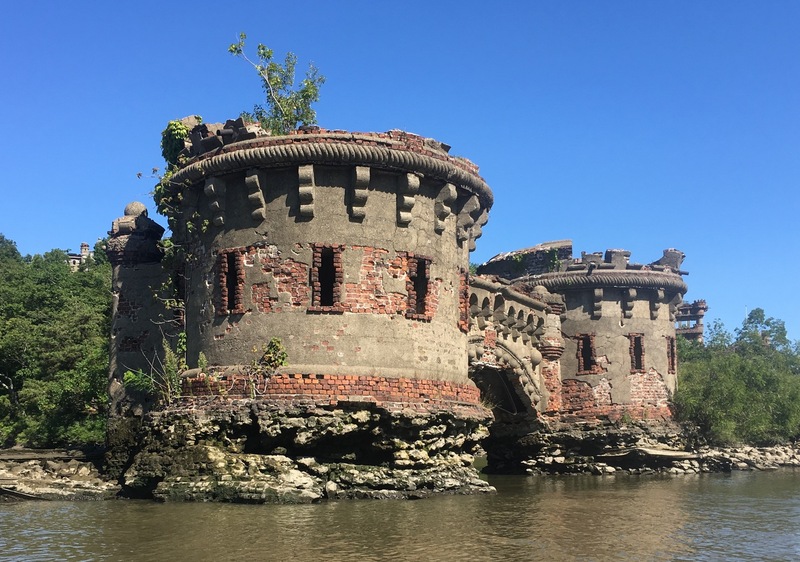 Fast forward to the present; the island is now taken care of by something called The Bannerman Castle Trust and what’s left of the buildings have been propped up by steel cable supports to avoid more wall collapses. It’s still off limits to the public except for events and tours organized by the trust. As I approached, I found you could still see the words “Bannerman Island Arsenal” on one wall. I was floating in the shallows, taking a drink of water when a fellow kayaker appeared from the South. We chatted a little, agreeing that it was a cool place to paddle. I moved on to circle the island, then headed west to cross back to Cornwall. By now, the river had woken up. A few jet skis and pleasure boats whizzed by. I was careful to stay out of their way, and to avoid a barge headed south, following the shipping channel in the middle of the river. As I got closer to the western shore, I noticed an old fashioned sailing ship to the north and turned to check it out. I never quite caught up. 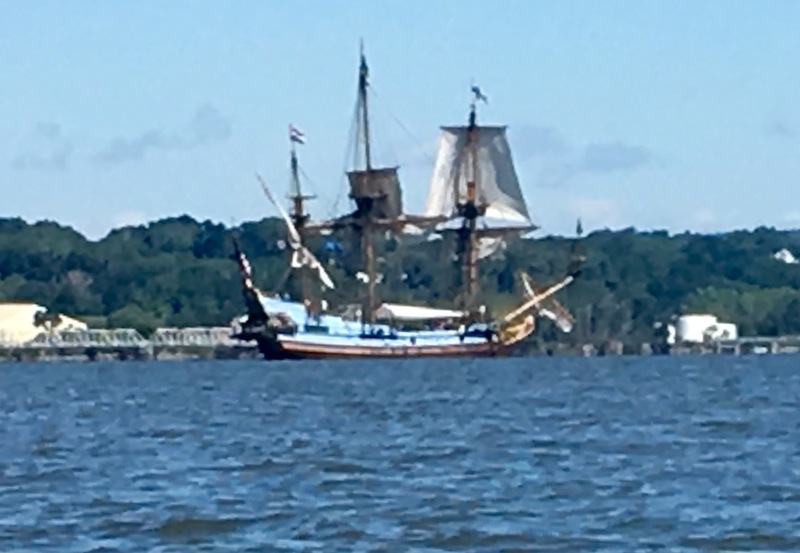 I later learned the vessel was the Kalmar Nyckel, a reproduction of a 1600s tall ship that was visiting the Newburgh area. It was a busy day on the river. 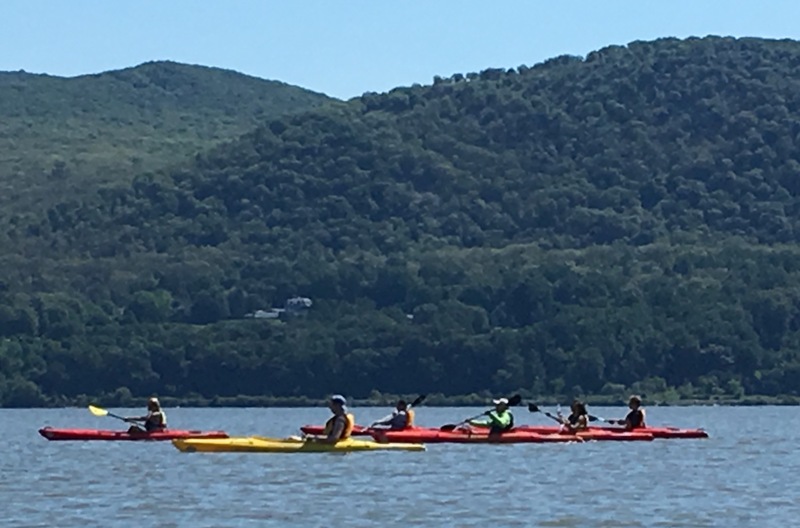 As I paddled north a hundred yards or so off the shore, I ran into a group of four paddlers on SUPs and a big batch of a dozen or so kayaks on a guided trip with an outfit called Storm King Adventures. I landed back in the same spot I’d left from, just under two hours later. I’ve done a guided tour of the island some years ago with Hudson River Outfitters from Cold Spring. Highly recommend. Nice story. Chapeau: I wouldn’t want to kayak across the Hudson. The other kayaker I bumped into at the castle said he launched from Cold Spring as well. I’ve put in there but I went in a different direction. Thanks. Crossing looks intimidating from Plum Point but once you start paddling, it goes quick. one day i’ll go — with a vest.